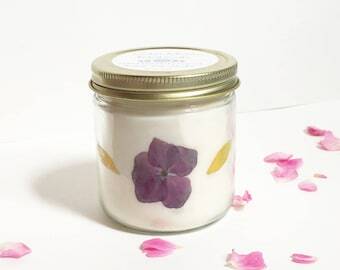 Two new pressed flower candle designs listed today! Perfect for the nature lover in your life! Three new wands listed today! White sage wood topped with angel aura quartz crystals, and one topped with a clear quartz! Get one before they're gone! New wildcrafted mugwort meditation and body oil listed today! Great for promoting dream enhancement! New wands coming later this week so be on the lookout! Lots of smudge sticks getting re-stocked today as well as some new designs on the way! 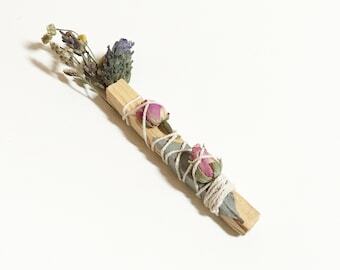 These new pale wildflower smudge wands are available now! Stay tuned for new perfume oils coming as well! 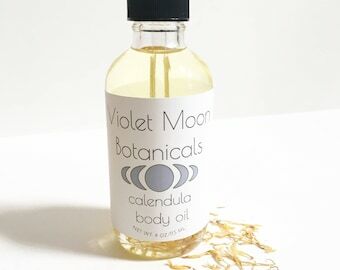 Calendula body oil is back in stock! Special edition all white wildflower and starlight sage smudge sticks are now listed! Starlight sage is a hybrid between black and white California sage! Only two of these are available so get yours now! New palo santo body oil listed today! Nourish you skin while promoting positive energy! Brand new handmade soap is now available! Made with all natural ingredients, natural colorants, and scented with essential oils, these are made in small batches! Get yours today before they're gone. New white sage body oil now available! Hydrate and nourish your skin while soaking in all the good vibes of wild white sage. 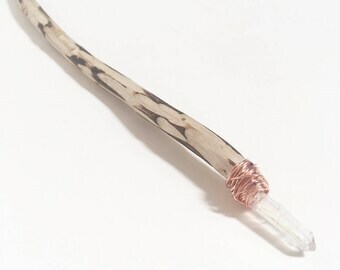 New white sage wood wands are now available. Each one is unique and only 3 are available! Get yours before it's gone! 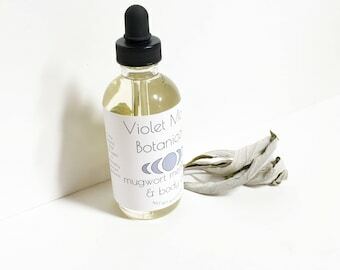 Violet Moon Botanicals has gotten a brand new look! These new labels are easy remove, allowing you to reuse jars once finished with the product! Soap is also coming soon! Check back soon! New all natural shimmer powder available today! Made with only 3 natural ingredients that your skin will love! Blush will be coming soon! New batch of pressed flower candles hitting the shop today! 2 more being added tonight! These are one of a kind, no two are alike! Two new crystal infused oils are now available! 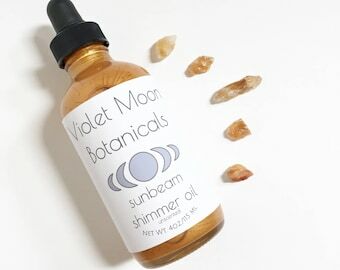 Amethyst and citrine multi-use oils, perfect for massages, moisturizing and ritual uses harnessing the power of crystals! Check them out! New smudge sticks hitting the shop today! These make gorgeous altar decorations and are made with hand picked wild harvested white sage! More products are in the works so check back often! First of a series of new smudge sticks that are coming soon! These wild crafted white sage smudge sticks smell like the fresh sage covered coastal California hills they are sustainably harvested from! Even more new smudges are coming soon so stay tuned! Happy new year! Starting off the year with a new one of a kind floral smudge bouquet made from gorgeous pale pink rose, wild harvested flowers and two kinds of wild California sage! Just a peek of more awesome things coming in 2017! Brand new mediation smudge kits hit the shop today! This will be my last new listing until next year! Remember to get holiday orders in as soon as possible for Christmas delivery! I'm taking orders until December 16th! New products have been hitting the shop all week! We now have gift sets available and this amazing moonlight infused shimmer oil! So good for your skin, and spirit! We have one more magical gift set coming soon so stay tuned! New smudge sticks for the winter season now listed! I'll have the matching palo santo and flower sticks available tomorrow, and some exciting new oils coming soon! New products added today! Shea and coconut body butter, rose coconut milk bath and lavender milk bath! Stay tuned for rose hydrosol coming soon!